Marimo Moss Ball Care Guide: How to take care? What are the benefits? Have you ever seen funky green balls of moss in an aquarium? Something that is gaining popularity amongst aquarists both beginner and advanced is marimo moss balls! This article is going to look at why these moss balls are becoming so popular and why it could be a great idea having a marimo moss ball in your betta fish tank. Starting with looking at what is a marimo moss ball, the advantages of having them in your tank, marimo moss ball care and also how to add them to your tank. Check it our on Amazon. Marimo is a type of moss ball that mainly grows in the northern hemisphere. Marimo is its Japanese name; it’s also is known as a Cladophora ball. Like most underwater plants, it photosynthesizes, it takes in carbon dioxide and releases oxygen as well as consuming nitrates. The moss balls are nearly indestructible – no amount of nudging from your curious fishes will bring these down! Despite their name, they are in fact not related to moss at all; they are more closely related to algae. The name “Marimo” was coined by the Japanese botanist Takiya Kawakami, a combination of “Mari”, meaning bouncy play ball, and “Mo”, a general term for water plants. 1. Aesthetics: First of all, the marimo moss balls look great! Looking right at home with other plants in a home aquarium, and provide a very clean yet natural feel to their environment. Even on their own, moss balls are a nice addition to any themed tank. Our beta fish have always approved the introduction of a moss ball to their home! 2. Reducing Nitrates: Nitrates are produced by fish during the course of their life. The level is usually harmless to them, but this is why it is important to do regular water changes. However, having a Marimo moss ball in the tank can help reduce the number of nitrates at all times. They feed on these nitrates to survive and grow. 3. Phosphates and particulates: The Moss balls not only provide an active defense against nitrate levels but also a passive one. Their spongy texture allows them to act as a filter, removing phosphates and particulates from the tank, which algae would use to feed and grow on things such as aquarium plants, cutting off sunlight or even on the glass walls themselves. 4. Oxygen: Just like humans fish breath oxygen – fish take their oxygen from the water using their gills (A side fact – Did you know betta fish are one of very few fish that can even take oxygen from above the water’s surface – but that’s another blog post). As fish breathe they take (and use up) the oxygen in the water and replace it with carbon dioxide. Well guess what? That’s right marimo moss balls take in this waste carbon dioxide and replace it with oxygen. Your fish will be pleased! 5. They are cheap! The price of a set of four giant Marimo balls is as low as ~$10. 6. Easy! Marimo moss balls are so easy to look after. Once you add them to your tank they require no attention! Taking care of your marimo moss ball is easy! In most cases you add them to your tank and they will then become part of your aquarium’s aesthetics. Providing both style and helping keep your tank water clean. Marimo balls require low to medium levels of indirect light – too much sunlight can cause them to brown. If this begins to happen with your moss ball, the best solution is to simply move the ball into an area of the tank with lower light levels. Take the time during water changes to agitate the moss ball slightly or simply place it on another side. This is to make sure it gets an even amount of light all around and also to retain its round shape. Floating is a regular sight for moss balls. Usually, it indicates a trapped air bubble inside, this can be fixed by gently squeezing the ball. 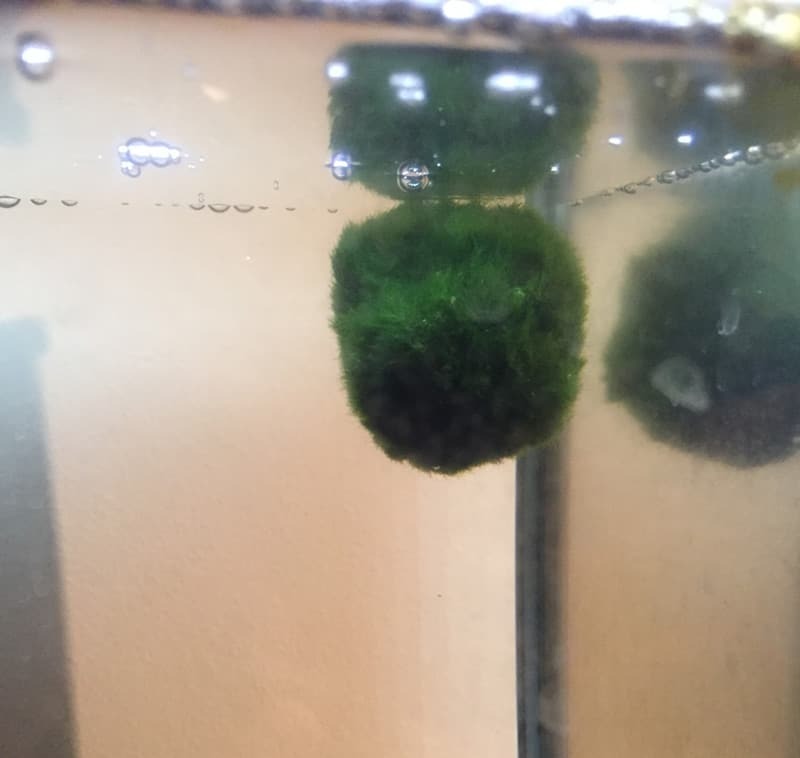 Usually floating happens when you first add a marimo moss ball to the tank. It will usually sink within a few days of being added to a tank. Don’t worry if your moss ball floats when you first add it to the tank, why not leave it there for your betta fish to investigate? First remove the moss balls from their packaging and inspect them for any brown or miscoloring. You should clean/rinse them before you add them to your tank. Who knows the type of water they have been sitting in! You do not want any of this in your tank. Use a jug or mixing bowl with some water from your aquarium. Add the marimo moss balls to this water and rinse and squeeze them to remove any dirt. Next, you can add them to the tank, just drop them into your tank gently. Some may float for a while. This isn’t a problem (as we said before, feel free to leave them floating for your betta fish to investigate). Move them into place. They look great with other plants too! Did you know you can get mini marimo moss balls?